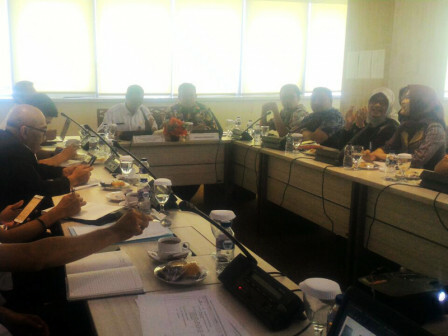 Semarang Council (DPRD)'s Commission A conducts work visit (kunker) to Jakarta Investment and One-Stop Integrated Service (PMPTSP) Dept. this Wednesday (9/5). Kunker is done to share about public service innovations.
" We want to learn about online service, goes to mall program, and others that maybe it could be applied in Semarang"
Semarang DPRD Deputy Head, Wiwin Subiono mentioned, her side wants to know about public services offered by PMPTSP Dept. such as Building Permit (IMB), TDP, and SIUP. "Jakarta Government's public service innovations are great. We want to learn about online service, goes to mall program, and others that maybe it could be applied in Semarang," she stated. Jakarta PMPTSP Dept. 's Complaints and Public Communication Division Head, Maryanta explained Semarang DPRD that Jakarta Government also conducts jemput bola (visit) service program. "We also explain about online service process that can accelerate permit administration within several hours," she added.